The 1984 United States presidential election in Texas took place on November 6, 1984. All fifty states and the District of Columbia, were part of the 1984 United States presidential election. Texas voters chose twenty-nine electors to the Electoral College, which selected the president and vice president of the United States. Texas was won by incumbent United States President Ronald Reagan of California, who was running against former Vice President Walter Mondale of Minnesota. Reagan ran for a second time with and incumbent Vice President and former C.I.A. Director George H. W. Bush of Texas, and Mondale ran with Representative Geraldine Ferraro of New York, the first major female candidate for the vice presidency. The presidential election of 1984 was a very partisan election for Texas, with nearly 100% of the electorate voting for either the Democratic or Republican parties, and only those two parties formally appearing on the ballot. The vast majority of counties in Texas voted mainly for the Republican candidate, a particularly strong turn out in this typically conservative leaning state. This is one of the last elections where many rural counties in the Texas Panhandle voted Democratic, especially near Dickens County. There is also one of the last elections with prominent Democratic strength in East Texas. Texas weighed in for this election as 5% more Republican than the national average. As of the 2016 presidential election[update], this is the last time El Paso County voted for a Republican presidential candidate. Reagan won the election in Texas with a resounding 27 point sweep-out landslide. This election, aided by having Texas native George H. W. Bush on the ticket, established Texas as voting reliably Republican during presidential elections. The recently Democratic-leaning state of Texas, had, for the previous two decades been making a transition toward the Republican party, which was solidified under Reagan and Bush into the Republican stronghold you see during the subsequent decades. The election results in Texas are also reflective of a nationwide re-consolidation of base for the Republican Party which took place through the 1980s; called by Reagan the "second American Revolution." This was most evident during the 1984 presidential election. No Republican candidate has received as strong of support in the American South at large, as Reagan did. Reagan also enjoyed high levels of bipartisan support during the 1984 presidential election, both in Texas, and across the nation at large. Many registered Democrats who voted for Reagan (Reagan Democrats) stated that they had chosen to do so because they associated him with the economic recovery, because of his strong stance on national security issues with Russia, and because they considered the Democrats as "supporting American poor and minorities at the expense of the middle class." These public opinion factors contributed to Reagan’s 1984 landslide victory, in Texas and elsewhere. 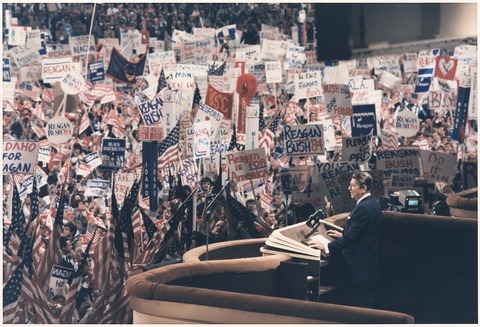 Reagan delivering his acceptance speech at the 1984 Republican National Convention in Dallas, Texas.